A loudspeaker or speaker, is an electromechanical transducer which converts an electrical signal into sound. 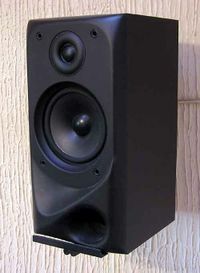 The term loudspeaker is used to refer to both the device itself, and a complete system consisting of one or more loudspeaker drivers (as the individual units are often called) in an enclosure. The loudspeaker is the most variable element in an audio system, and is responsible for marked audible differences between systems. Copyright © 1996 - 2019 Amazon Internet - All Rights Reserved.